Bird's nest has a tradition of use in traditional Chinese medicine for more than 400 years for its aid in respiratory health, energy, boosting properties, skin complexion and general longetivity. Where actually bird's nest came from ? It is the saliva produced by a special species of swallow called the swiftlet while building the nest. The saliva glues with other impurities (such as feathers) to form the nest. Men scale heights and risk their lives to harvest it, and consumers pay big bucks to eat it. Finding a high quality of bird's nest is a challenge because of the fake nest or artificial in the market. That is the reason why it is important to buy a trustworthy brand that gives you a natural and genuine bird's nest product so that you can enjoy all the health benefit bird's nest offers. The Grand Imperial Bird's Nest brand had a superior quality bird's nest that is manufactured and distributed by GIBN Holdings Sdn Bhd, one of Malaysia's leading and fast growing wholesaler Company. Grand Imperial Bird's Nest uses only bird's nest that have been carefully harvested and is manufactured using advanced technology in a GMP & HACCP Certified Facility. It obtains HACCP certification on 2012 from Ministry of Health Malaysia and it is certified HALAL. Grand Imperial Bird's Nest is 100% natural and free of preservatives, artificial flavorings and colourings. Mommy Jane had took the initiative to tried on the Grand Imperial Bird's Nest Instant Drink Series with America Ginseng. It comes with 3 bottles at 150ml each. Each bottle had 35% of bird's nest together with American Ginseng, Rock Sugar Solution and Purified Water. The amount of bird nest given considered a lot as compare to those that I had before. Loaded with yàn wō (燕窝) and American Ginseng, it is rich and thick in its texture. The taste not too sweet with a bit of bitterness from the American Ginseng. With egg-like aroma and pleasant taste, me and my Little Angels really love the taste of it. Grand Imperial Bird's Nest will increase my Little Angels' immunity against illness and sickness. For Mommy Jane, it will promote a radiant complexion and prevents effects of aging if taken regularly. Bird nest best to take with an empty stomach or night before sleep. With an empty stomach, it is easier to absorb all the nutrition. The expiry date will be 3 years from manufacturing date. Besides the Instant Drink Series, Grand Imperial also had those dried bird nest in vacuum packaging. Grand Imperial Bird's Nest made from their own breed house nest, which has been carefully selected personally and cleaned after harvest. 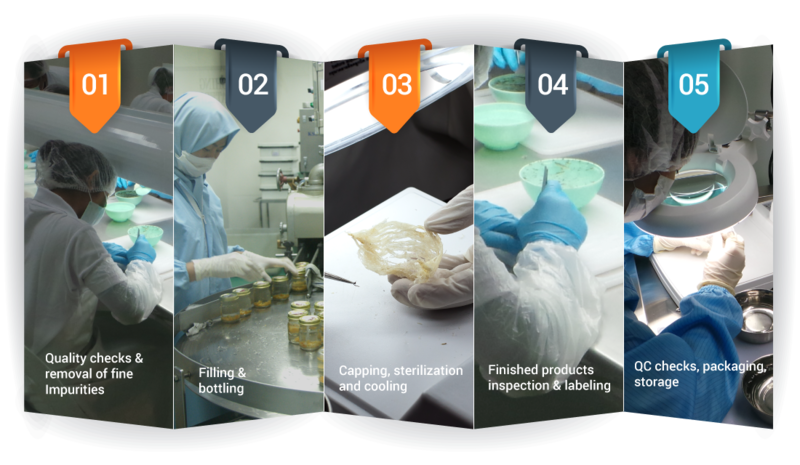 It is manufactured under strict and hygienic condition by a specially designed vacuum sterilization process. Grand Imperial Bird's Nest is rich in protein, calcium, iron, postassium, magnesium and have a high nutritional and medicinal value with anti-cancer properties to the ability to improve concentration. It is also contains cell-division hormone and epidermis growth factor (EGF), which promote reproduction and formation. Amino acid found in bird's nest improve our immune system, strengthen heart function, slow down skin ageing process and rejuvenate the complexion. The nutritional content of house bird's nest is highly water-soluble and can be readily absorbed by the body. With the nice packaging and the benefits, Grand Imperial Bird's Nest is suitable to give to my Mom on this coming Mother's Day and my Father to celebrate his birthday on May. It will relieves their cough and phlegm and strengthens their internal organ and improves their appetite too. A good way to show that we are concern with their health and I'm sure both my parents will feel appreciated with the gift given. 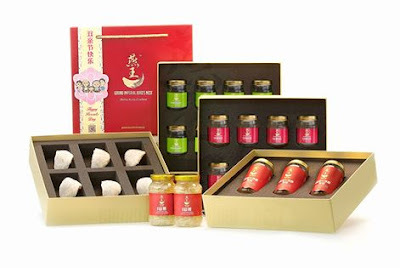 It is suitable for corporate gift as Grand Imperial Bird's Nest is suitable for everyone too. Grand Imperial Bird's Nest Instant Drink with American Ginseng (as per photo above) only cost RM199.00 for 3 bottles at 150ml for each bottle. I always believe to grow a healthy child, we need to take care of them when they are still fetus. Bird's Nest is proven to enhance the immunity of the fetus and speeds up recovery after delivery if taken during the pregnancy period. Taking Grand Imperial Bird's Nest Instant Drink is very convenient too coz' it is a ready to drink once opened. Save times and energy to boil it especially Mommy Jane was always busy at works and busy grooming up my 5 Little Angels. Try it and I'm sure you will love it too for the benefit of yourself, your loved ones and someone that you really care of. wow... very lucky to get some bird nest to try.. personally I have not tried any bird nest for so long..
Miera, I'm sure you will have it soon. Eat bird nest is good for all of us in terms of beauty and health. Nutritious. I love bird's nest. I boil it once a week. This Grand Imperial Bird's Nest looks very luscious and convenient. usually those outside is lack of it and too sweet. Rose, agreed with you. Grand Imperial Bird's Nest are very generous with their yan wo. Boil is good too provided you got times to do that. My grandparents love to drink bird's nest as it will keeps them healthy. I should start eating bird's nest too. Rawlins, bird's nest is good for everyone. Your grandparents really good in taking care of their health. bird nest! I like! So yummy and I couldn't have enough of them haha! Bird's nest used to be a luxury supplement that people buy for the ill. I am glad to see that it is no longer the case! Emily, agreed with you. Now it is more affordable and more convenient to have it. Ivy, I love it too. Good that you still maintain your health and your skin with bird's nest. Every ladies' favourite health supplement. It aids in healing too so whenever I am injured or after sickness, I'll make sure to consume bird's nest. Amazing post, beautiful pictures as well, I love this blog, truly inspiring, love to try one of those products one day, thank you for sharing!! !